US President Hussein Obama and US Secretary of State John Kerry are finally listening to Israeli Prime Minister Binyamin Netanyahu. Prime Minister Netanyahu told Israeli Army Radio on Tuesday that there is no reason for Kerry to come to Israel now, and so Kerry will skip Israel on a trip to the region this coming week that is meant to reassure skeptical allies about the Iran nuclear sellout. Meanwhile, Secretary of Defense Ashton Carter got some rather rough treatment during a trip here earlier this week. Ash Carter was in Israel hoping to begin a dialogue on how the U.S. and Israel can mitigate risks of the international accord intended to limit Iran's pursuit of nuclear weapons and to lift many economic sanctions. But Carter didn’t even get to begin that beginning. Netanyahu is said to have insisted on talking only about how the Israeli government would work against the deal while Congress is reviewing the accord for 60 days, a period mandated by recent legislation. 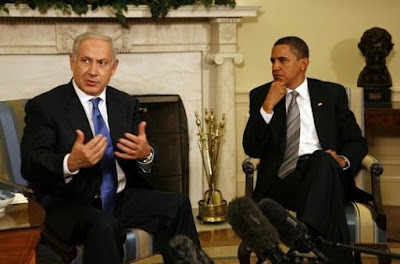 An Israeli official familiar with the conversations told us this week that Israel is for now trying to thwart the deal. But that could change on Day 61, the official said. Carter confirmed on Wednesday that in the meeting, Netanyahu "was very clear as he has been publicly in his opposition to the deal." And a U.S. defense official told us that in the meeting, Netanyahu didn’t explicitly rebuke the defense secretary. In fact, at other meetings in the trip, Carter discussed expanded security cooperation with Israel, and the official said Carter left optimistic despite tension on Iran. "The decision makers in Israel believe we don't start the dialogue now because it will be used to make it seem like we acquiesce on the deal,” said Michael Herzog, a former senior Israeli defense official and the brother of the leader of Israel's Labor Party. All of Israel’s major political parties have come out against the deal. The Israeli campaign for now is focused on Democrats in Congress. Israel's ambassador to Washington, Ron Dermer, has had dozens of meetings with lawmakers, urging them to vote against the deal after the review period ends in September, according to Senate and House lawmakers and staff members. While Dermer and allies like AIPAC are working Capitol Hill, Netanyahu will have lots of opportunities to make his case directly to lawmakers as well. Dozens of U.S. lawmakers will travel to Israel during the August recess. House Minority Whip Steny Hoyer, a key and as yet uncommitted vote on the Iran deal, will lead a group of freshman Democratic members of Congress to Israel next month. Meanwhile, as soon as the vote in Congress is over, the Obama administration is likely to allow a resolution that will be aimed at mandating 'Palestinian statehood' to pass the United Nations Security Council, and Obama may give us bunker busters, which he will of course prevent us from ever using.